The other day I wrote about the optimal size for your Pinterest posts and some suggestions on what to post and why. You can read that full article by clicking here Optimal Pinterest Post Size. 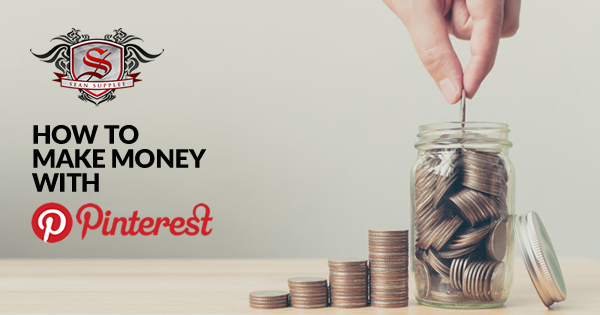 In this post I will be going over one of the most powerful ways you can start making money with your Pinterest account and map it out for you so you can get started right away. There are a few things you will need to not only optimize this method but also provide a higher quality feel to it all the list is below. That’s it! Those three things will set you up to start making money on pinterest, the rest of this post will deep dive into each of the 3 listed. ClickFunnels is the most powerful tool you can have, it really is your one stop shop to do all your money making online and its going to literally save you thousands of dollars as you build and grown. You will be able to build pages to not only capture leads but sell products and services of your own, run membership areas, host webinars, email those leads, create follow up sequences that no other auto responder offers such as automated voicemails, text messages, Facebook messages and more! When I tell you its the all in one solution I mean it. By joining ClickFunnels via the button below you will be able to lock in your trial account and get your very own free domain. There are a number of ways you can start building out income with ClickFunnels and it all depends on what level you are currently at. Beginner – Create a simple lead capture page that promotes an affiliate offer of a product you really enjoy. Building your list is key and this is how it’s done. Professional – Create your own product, service, membership area or course you want to sell. When starting out you might not have something you are selling yourself. While I would highly recommend working on it and doing it a great method to start off with is affiliate offers. Pretty much every product or service you are currently using that you low has some type of kick back from their affiliate program. Since you already know and love it, it will make it that much easier to create pictures to post and create a simple and powerful Funnel for it. If you already have your own product/service consider building on top of the front end with ClickFunnels. Heck you might even be able to move it all on to ClickFunnels and end up saving some serious money because of it. This is a free to use tool which has helped me greatly. If you have no design skills at all this is a great fit and will end up saving you so much time. Simply join Canva and in the search type in Pinterst. It will give you the correct size to work with for your pin and give you a number of templates you can choice from. Alright now that you have all your tools in place its time to build out the function of how this all works. Your Pinterest account will need to be a business account you can register for one by clicking here. The diagram above shows just how simple this is to setup. 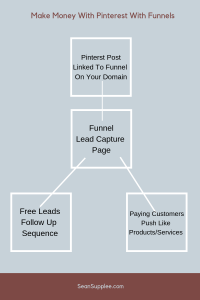 Once your cores are in place such as creating the funnel and affiliate product or your own all you have to do then is create pins and point them to your funnel. You will be driving traffic and making sales in no time all through the power of images.